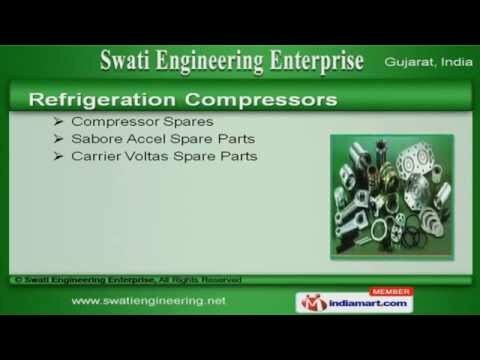 Welcome to Swati Engineering EnterpriseExporter & Trader of Refrigerator Compressor & Compressor Spare PartsWe are an ISO certified company, established in the year 1981, at Ahmedabad. Trustworthy vendor base & stringent quality inspection make us stand apart from also-rans. Blue Star Limited & Alkanets Private Limited are some of our prestigious clients and weare supported by Competitive prices & customized solutionsWe offer a vast range of Refrigeration Compressor Spares. Refrigeration Compressors offered by us are well known for their durability. Our Trane Utility, Grasso Kirloskar & Old Compressors are widely appreciated in themarket. Along with that we offer Refrigeration Compressor Spares that are a class apart. We also provide Oil Pump Gears, Compressor Gaskets & Pistons that are in hugedemand across the global markets. Used Refrigeration & Carrier Compressors are available at best prices.